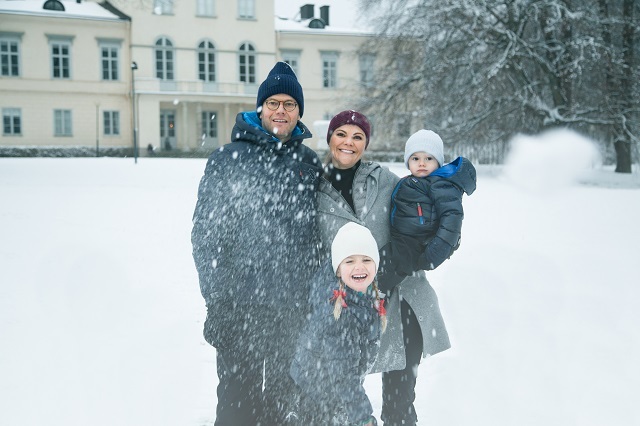 The photo was taken at Haga Palace, the family’s residence, outside in the snow. The video that was released features the family outside of the children’s playhouse, then sledding down a hill and having a snowball fight. The video ends with the family back inside by a fire, playing with games and eating cookies. Oscar has the biggest smile while sledding, which is adorable. I think this is the first time I’ve ever seen him actually smile. On Thursday, December 14, Victoria brought both Estelle and Oscar to receive the firs at the Royal Palace from students at the Swedish University of Agricultural Sciences (Sveriges lantbruksuniversitet – SLU). Every year since the late 1960s, students from SLU have brought a set of King Spruces to the Royal Palace. The King Spruce got its name from this tradition. This is the first year that Oscar has attended. Estelle is an old pro at this event, having done it four times now since 2013. It is adorable. Could those two children be any cuter? It is adorable. They do such a good job with this sort of thing. So precious! I wish I could go sledding and snowball-fight with my kids. But I’m pretty sure if it ever snowed in my area it would be a sign of the apocalypse. Love love LOVE the video and photos. OMG, the SRF really get this right, every year. The one last year was super cute too, with Estelle and V&D baking that flatbread. And the year (or two) before where she was playing hide and seek in the pillows and decorating the tree. I love that Oscar was included this year. Yay! I hope they are really as lovely as they seem from the outside. I’d be so disappointed if they are really a-holes, lol. Oscar and Estelle’ smiles are adorable. I love how the family are in sync and playing together both in the snow and at home. They can be such a genuinely cheery bunch. The photos are uplifting. The Cambridge Christmas photo is so sterile in comparison. Chris Jackson took the Cambridge family portrait, which they’re using as a Christmas card. I’m sure KMR will get to it but the kiddos look precious. I love seeing the early Christmas tree delivery for the Swedes! Estelle is a darling and Oscar so cute. I’m shocked that this is a Chris pic. Usually he does much better. kate is so photoshopped she looks like her madame Tussaud figure. Good point. I’m guessing that Chris got the Camb treatment and had to produce their version. Remember Kate and Vogue? We know how well that turned out. I see the same sticky fingers here now that you mention it. Sarah, you are dead on. The kids are adorable in the Cambridge photo, but it does seem…disconnected? I think it’s the blank background and everyone being in obvious spring/summer attire. It just makes me think sterile and manufactured. Like, let’s dress up very formal and pose stiffly for a JC Penney studio photo. I don’t know, I want to see family, warmth, connections. But it just is how the Cambridges present themselves: immaculate, perfect, and unrealistic. I find it interesting how they choose photos like this while the rest of the family generally don’t, even HM and Philip have chosen informal photos that are sweet, not super posed, stiff formal photographs. The BRF is more formal and protocol oriented than other royal families, sure, but it’s only the Cambridges who seem to really do this. Even their photo that one year in the garden of Anmer, it was photoshopped; Charlotte was pasted on there, probably because the photo where everyone else looked great maybe she was making a face or upset! George looks so sweet and shy, Charlotte is the sassy one. You can see their personalities, but it’s still–the parents are muted cardboard dull figures. “I want to see family, warmth, connections. But it just is how the Cambridges present themselves: immaculate, perfect, and unrealistic.” Very well said Ellie. The Cambridges lacks warmth, I see this even in videos. Agree, Ellie sterile.You don’t feel wellcomed with this family but like an intruder. The SRF has a much better understanding how to connect with the people without showing everything. Yep, Ellie, they look like cardboard cutouts. I think the sterile photos are for two reasons. First, PW and Kate like their normal image to only go so far and they pull out the look of royalty when it has a purpose for the couple. Second, the sterile look is for privacy. heaven forbid anyone in the public should get a glimpse at the private lives of the Cambridge family. They guard themselves as much as possible. My only hope is Harry and Meghan behave differently, and show W&K they can show some of themselves, and still maintain some privacy. I guess a background of trees or any sort of nature would also be an invasion of privacy? I guess they don’t want us to know they like trees? I actually believe what they give us is the real Camb experience. Sterile, two dimensional, cold and alienating. The rest is just for show. I’m thinking that photo was the one they gave out to embassies and the like on the Poland-German tour – hence the formality. Bless you, Julia, for being an eternal optimist. @Maventhefirst – + a million on that photo being the real Cambridge experience: sterile, two dimensional, cold. And, IMO all William is accomplishing is that the public won’t really care about them enough to keep the monarchy going. The people that are funding his lifestyle and allowing the monarchy to remain need to form a connection to the family – and this includes the children. This is why I love the way Victoria and Dan parent. I love seeing Estelle (even as a toddler) knowing how to shake hands and interact with the public that come out to see the family. She’ll feel comfortable in front of crowds and will have proper manners for her future role. They look like the family designed to sell the 8×10 photo frame on the department store shelf. Agree completely. So dull and bland. Oh my gosh bluhare! You’ve nailed it! I agree. I have loved the SRF photos much more than the BRF photos for a while. Even the one time the Cambridges tried to look relaxed in nature (the one in their KP garden) looked creepy and strange. Or, how about the photos on the skiing trip, which looked as if they were taken in a studio with fake snow. Were those holiday pix, or just a rare opportunity given to us to see one big happy family? Your comment made me chuckle. If you think about it, when you start remembering all their photos, they tend to weird. This could actually be a new genre for royals! Maven, I just nearly choked on my coffee. Soooo funny!!!! Record it and perform it, please! Was there picture taken in Germany when they were there? The clothes look like what they were wearing on one of the visits? George’s outfit reminds me of the picture released for his 4th birthday back in July so maybe right before the tour? I think all those photos were taken at the same time. Omigod,, Maven, you just made my life. Totally agrre LizB, the Cambridge photo looks disconnected. I’m looking forward for the pictures of George and Charlotte with their newborn sibbling next year. Problably taken by Kate. About the Sweden Christmas photo, simply adorable and the video is gorgeous. Why would Kate knowingly wear a suit in the same shade as the background for the photo? Makes no sense. This photo doesn’t spell Holiday Greetings to me at all. The kids are so cute. Sassy little Charlotte and her cute older brother. But, this just smacks for a cheap holiday photo, as someone else mentioned, from J.C. Penney, or Sears. Even the photos taken with Santa at my local shopping mall are better than these. It also bothers me that William is always with George and Kate always with Charlotte. I’d love to see a photo of William holding his little girl’s hand, or with her in his arms. And, I do recall many more photos of Kate with her son, but those were before Char was born and if William was not in the photos. Oh, I just saw that awful photo. I imagine the photographer saying “Now you need to show some sort of connection to your children. Maybe touch them, as if you care about them.” Notice Kate isn’t really touching Charlotte, she is just showing off the ring. Do the Cambridges even like each other? Oh, JET, you touched on something. Pardon my pun! How are you feeling? Hope all is well. That is a great observation, JET. Could she not bend down a smidge? At this point it’s nitpicking but on the other hand it shows the lack of wholeness, IMO. No, I believe there is no love lost between the Cambridges. All is well here, thank you. I’m actually trying to keep my anxiety down about Christmas. I’m anticipating detailed questions about my health and future plans that I don’t want to answer. My husband’s family don’t pick up on social cues, so I have to be direct with them. My husband and I are the black sheep in our families, politically and religiously different from everyone else. So we get an earful every time anyone visits. I plan on drinking lots of wine and finding things to clean in the house. I think William and George get on well, but there is no interaction with little Charlotte? Or was she just more interested in the camera, Chris and anyone else behind Chris? Yes, jenny, we have never seen a photo of William holding or touching or interacting with Charlotte. It’s always the boy. That’s actually not true. Yes, Kate has her more often but at the helicopter he helped her in (or something like that) and on the Canadian trip he held her at the kid event. I also think he had her on the ski pic? Could be wrong in the last one. I stand corrected, Sarah. There is one pic of him holding Charlotte (in Canada). *One*. Formally, he never holds her. Well it is rare enough that I can remember those off the top of my head. =)They stand out for that reason. The only time I really like William is when he’s engaging with his kids. He seems genuine then. No, Kate had her in the ski photo. JET, hang in there. Family issues during the holiday season can be tough. I hope you can free yourself for a bit and avoid any comments that are none of the speakers’ business. Darn, Ellie. You got there ahead of me. The Cambs’ photo is indeed, very sterile, even without comparison. And cold. Quite alienating. And badly composed. Ignoring how bland the colours are, the kids are too low compared to the adults. Chris Jackson should know better since he is supposedly a professional. A Sears portrait would have looked better. Nic, I doubt that the composition was Chris Jackson’s choice. No professional photographer is that unskilled. I mean, just look at the background! And the godawful, amateur photoshop especially of Kate. You really expect more from William and his wife? They are two of the most staid, sterile, boring, people on earth. Of course their Xmas card will be devoid of life. The Cambridge photo looks like it belongs in Business Weekly, not a Christmas card. It’s the least Christmasy holiday photo I’ve ever seen. As you said, sterile. The Swedes are still royal but make you feel like you could be their friend. Can people enjoy the Swedish family without comparing them to the BRF (do what you want but just asking)? I try not to compare and contrast at all the time; different people, different cultures, different way of doing things. No. It’s human nature to look for context and to compare. Especially considering that this is a Kate blog. Some of the Swedish love on this site seems so fake; people hate the Cambridges and so they fawn over the Swedes. I like Victoria and Co. but I don’t constantly look at ways to say how much better they are then the BRF; I just enjoy what the present to the public and move on. Jessica, the fact that many people seem to love the Swedes says much about the way in which the Swedish Royal Family welcomes everyone into their lives. It doesn’t smack of any falseness to me. It’s all very real. We are all entitled to our different opinions. It’s just hard for me to see any falseness in anything the Swedes do. There’s a warmth there that I don’t think I can deny. Seriously? Have you evidence for your opinion? Is it so hard to believe that at the very least the Swedes are good at PR and at the very best, actually are a loving family which shows in photos?And that people are responding to that? How is that hard to believe? They *are* that much better than the Cambs when it comes to PR and authenticity. It shows in the responses of people who are not on a sugar site. In other words, people are responding wholeheartedly to what they see, but your comments suggest we have nothing better to do than fake it in order to trash the Cambs. As. If. I don’t need evidence; it’s my opinion. No, having thought about it more, it is not an opinion It is an ad hominem argument, attacking other commenters for their opinions. Basically, if you make it personal, it’s irrational. If the other royals are so great, though, why do we have to bring Kate into the conversation about them? Why not just say we like the royals we’re talking about, and be positive about them, and leave Kate (and the negativity she brings) out of the discussion since she’s not relevant to them? The world doesn’t revolve around Kate. Because this is a Kate-centric blog so comparisons are going to be made? And I didn’t see anyone making comparisons. Just the comparisons in the difference pics and even then one person said how different they were. Everyone else just generally said it was a bad/weird pic to release for for the holidays without comparing it to the SRF. It wasn’t until someone said can we not compare them and that peeps like for them are fake did comparisons start. What are you talking about? I asked a simple question; how is that an attack? KMR seems to be the only person who has answered my question. It’s a blog about Kate. Those comparisons are going to be made on a blog that is about Kate and occasionally delves into other royals. Asking people to not talk about Kate or make comparisons on a site called Kate Middleton Review is a bit ridiculous. And we’re comparing Christmas photos to Christmas photos. They all released around the same time. The Swedes and even Charles & Camilla have warm, loving photos that make you really look at them as people and have feelings about them. The Cambridges are sterile and cold in comparison. Like robots. You couldn’t not compare them, tbh. Yes I could not compare them because this is a post about the Swedes. It’s very simple to not mention the Cambridges; I’m sure KMR will do a post about the Cambridges and Char going to nursery school. Also please re-read my post, I never said no one should compare and contrast. Stop making things up. With all due respect, it does on a blog centred on Kate. Unless you want to rename it “The Royals” or something, which, I imagine, would attract a completely different set of folk. Jessica, I didn’t make anything up. I never said anything to you directly. Sorry to burst your bubble there. I don’t think it’s fake. I think for most of us, what we like about the Swedish family are things we find lacking in Williamm Kate and the way they engage the kids. I hear you about that Sarah, but I would have to say, can’t wait for a republic no matter how charming they seem. It just makes no sense to keep any royals anywhere. Hi Jessica I respect your views entirely,and besides,we aren’t doing rocket science on this site,just giving opinions about royals whom we’ll probably never meet. I will say from my own experience of having lived in Sweden briefly I fell in love with the people,culture,food,decor,et al-this is where much of my heritage is from so perhaps I’m biased.Anyways ,I think the Swedes have a great way of showing their love and joy on camera,cards,photos and people catch onto that when it’s real.It’s easy to compare these two families on here too,when I think today was when the Cambridge photo was released,and they are so glaringly different,but you have a good point to enjoy (or not)both families for different reasons.As for me I do adore Victoria and family I really believe what you see is what you get with them. I’ve spend time in Sweden (and I’m part Swedish too) and, yes, the Swedes do things slightly differently. I do have to say that I love spending time in Sweden at Christmas and can recommend it as a great time to go there. My Swedish family have something Christmas related every weekend in December, starting of course on 13 December with Santa Lucia. I enjoy seeing the videos and photos which the Swedish Royal Family release, this year’s video is so cute! Does it make me feel more connected to them by seeing the kids growing up? Yes, I think so. It opens the door to their private lives, only for a moment, but we see enough to be satisfied. Is it slick PR? It can possibly be described as such but it’s authentic. Estelle is already such a big girl! I remember when she was a little baby, children grow up so fast. I love royal Christmas photos and especially the swedish ones! It’s great to see them interact as a family and to watch the kids grown up. It is lovely seeing the Swedish kids grow up. The Swedish royals understand the public need to see them so release a little of the family videos and photos, that are for the family anyway. If that makes sense. Great picture. Informal and fun. They all look great. The children are adorable. I absolutely love watching this video every year. This family never dissapoints!Love the video and the photos.Victoria and Daniel FTW! The video is adorable! I agree thay you get a sense of warmth and comfort with this family. You can tell that they are very close. Side note, I like Victoria with her hair in a pony and not her usual severe bun. I can’t. With all the professionals they have available on every subject, history- just the whole ball of royal wax, they produce substandard photos. As an art history major, Kate would have studied composition, lighting, aesthetics, proportion, painterly techniques to “draw in the viewer” and so on (and I could go on…). Aside from William, what did she learn and appreciate from her college studies? I’ll go now–am procrastinating from mundane paperwork of daily life that was due mmm sometime ago. And they had a professional photographer who really has no excuse! I follow Chris Jackson on Instagram and his photos are usually lovely. Hmmm, just like Mario Testino’s photos are usually great. Yes, so why are this photo and the Christening photos so awful? Testino’s iconic photos of Diana bring a tear to my eye they are so beautiful. The Cam Xmas photo looks disjointed and her lack of arm is strange….I appreciate where it is but my brain tells me it is missing! I’m convinced Kate just goes on Pinterest and pins all these godawful hipster filtered photos or whatever it is she’s into. Yes, Chris and Mario are accomplished photographers and who earned their reputations. So why would they put their names on this crap? My husband is a photographer and I show him these photos from time-to-time. Regarding this last Cambridge shot he said, “This is sh*t and it should never see the light of day.” Are these guys so desperate to be in the royals’ good graces that they’ll produce horrible material and willingly promote it? omg, that photo of Kate holding Charlotte in the hallway on her christening day looked as if she was being backed up against a wall. It was so claustrophobic and such an odd setting for a picture to be taken by a “great’ photographer. I have the feeling that the christening photos were “played with” after Mario Testino had handed them over. The released photos were awful and imo amateur. They just weren’t of the quality expected from Testino, if you want to see his work do what Birdy suggested and have a look at his photos of Diana. He’s so good with how he uses light. The final product, imo was not him. Questalynne – By all accounts, Kate was just studying hard for an MRS degree (or, in her case, an HRH). There is some second-hand account online about how she regularly straight up copied from another student and clearly not much – if anything – has sunk in regarding her studies/degree topic. She’s a terrible photographer and seems only interested in visiting museums when her own portraits are on display. I also don’t get how someone majoring in art history would paint their entire home beige. She just doesn’t seem creative – personally or through her interests – or artistic or even knowledgeable about the very subject in which she majored (asking if Faberge eggs were still being made). Oh, that wonderful Swedish Royal Family. The children are so adorable. So real. The love the parents have for their children and the love the kids have for Mom and Dad are heartwarming. Little Oscar shaking hands Estelle, such a little lady — a Crown Princess in training. Love them!!! big applause for victoria and daniel. they find the perfect balance between the public and the private sphere and involve the children in a playful way. I agree with all the comments above regarding the Cambridge’s overall sterile portrait. The beauty of the Swedish video is that they don’t deny they live amidst beautiful surroundings, ( the background building in the video); but also provides contrast with a more realistic, intimate, and familiar family setting. Their photographs and videos shine with personality and warmth. Remember the photo/video when little Estelle was making cookies, or bread with her parents? It smacked of a real family doing things together. It was not staged. Kate supposedly loves to cook. How cute would it be to see Charlotte and George stirring up some confections, or licking the frosting from spoons? In my dreams, I guess. I loved that video. It showed the parents having fun interacting with Estelle and having fun themselves expressing childlike glee. It was cute when Estelle just wandered off! I always enjoyed the swedish videos of the royal parents baking with their children. There are some adorable videos of Carl-Gustav, Silvia and their little children cooking or baking and now, Victoria continues this tradition, it’s nice! I remember the video where V&D were walking in the woods. Estelle was dragging a tree branch. Oscar was in a baby harness. And then they sat at a campfire. So lovely. That video, and it’s lack of pretension, is what drew me to the SRF. Me, too, and then, finally, a smile while sledding. Love!! I look forward to the video this family puts out every year at Christmas- it always warms the cockles of my heart. And Estelle is such a sweet girl. Squeeeee! What fun! This is even better than last yrs. I quite enjoy this family. I like the outdoors aspects and those are some snazzy sleds they have there. Also a great fireplace and fire going on. Thanks for this! I’ve already watched it twice! The video got an automatic thumbs up from me the second I saw Victoria’s flowy ponytail! I love the photo! But I have to give them major props for releasing a video as well. That is where you really get to see them interact as a family. The love is so evident. This makes the public able to relate to them even though they are royals (I love that Victoria hit Daniel in the back of the head with a snowball 🙂 ). So good on them. Yes the video is always my favorite part. My favorite video was Estelle making Christmas cookies. Love the Swedish pictures and video, they look like such a loving family and most importantly it looks like they have a lot of fun together. As for the Cambridges, what a colorless bunch of stiffs they appear to be. As an American, is this due to the formality of the British monarchy, as they all look very posed. I also interpret this cringingly boring picture as a reminder to us regular folks that they are the aristocrats and we will never have access to their world. Good points. The Cambs would agree with you. However other royals? Perhaps not so much. Charles and Camilla’s photos look natural, warm and human. So, no. It’s just the Cambs ever on their high horse, IMO. Hi Maven, just checked out Charles and Camilla’s picture and you are right, they do not look like old-young fogeys. The Cambridges are working diligently to prepare the public for a very inaccessible BRF when William inherits the throne and in this one thing they are succeeding. IMO, this is another part of their strategy to do as little as possible. I just looked at the Cambridge picture again and Kate has no right arm! It has somehow gone missing! She most likely has her arm on William’s back, which is why you can’t see her right arm in the photo (because it’s hidden by William’s body). 1. The picture does not radiate any holiday vibe. 2. The more I look at the photo it calls to mind those bad family photo greeting cards that have funny captions. For instance, this picture could say: Merry Christmas from the Royal Village of the Damned. Awkward. Not something one would usually see in a professional photo. It really looks weird, too. It looks like another composite photo; we all thought the 2015 autumnal pic out in the garden was a composite too. There’s no sense of togetherness. Plus the Photoshop work is very heavy, giving an artificial vibe. It’s just…odd. It’s odd because Chris Jackson has taken some great evocative photos, having looked at a lot of his stuff on his social media. He’s a really good photographer! His awards are well deserved. Chris may have been under instruction from his clients to deliver a certain look. This image is devoid of anything personal with a cool tinge to the picture. Kate is Photoshopped to a ridiculous level; she seems to be looking to her left while the others look straight ahead. The photo looks as if they have yet to be inserted into a background. Charlotte and Kate not interacting while William and George do. Images speak volumes. This one reeks of formality and no warmth; definitely keeping their private life private. And please don’t forget that photoshopped leaf, on Kate’s knee if I remembver right? It’s a great reminder that sometimes you can overdo a photo? I wish someone would translate the video for us so those of us who don’t know Swedish can know what they’re saying! I think my favorite video though is the one with the cookie making. Then Estelle says “Merry Christmas and a happy New Year” and at the end they discuss about the toy or what ever it is, that should they take another piece or the other one or something like that. I love Estelle’s face in the picture; that’s totally an “I gotcha!” look! I’ve got similar snowball pics with my kids. And Oscar’s grouchy looks get me every time! How about get a small tree for somewhere else in the house?! 😀 We have a larger one in the living room, and my kiddo has a fake tree I got on massive clearance after Christmas a few years ago. He loves it. I got my kids a little fake tree this year. I said we would assemble and decorate it after they cleaned up the play room. I’m still waiting. We are fulltime RVers and have a little 3-foot tree, but even that takes up too much space. I’d say your tiny home is smaller than our 5th wheel and we have about 300 square feet. Isn’t there a Christmas card and a Christmas photo but the Cambridges do not always release a Christmas photo? 2016 – no Christmas photo, Christmas Card was a family photo from the Canadian tour. 2015 – Christmas photo of the Cambridges was a autmnal photo presumably taken at Amner, my guess is that this photo was also their Christmas Card but not 100% sure. 2014 – Christmas photo was a solo photo of George sitting on steps, Christmas card was William, Kate, George and a butterfly. I love, love, LOVE the Swedes! They are so natural and warm towards each other. You can tell that Victoria and Daniel spend time with their kids as a family. And they do normal things while not trying to hide the fact that they do normal things, despite their status. They’ll never be “normal” but their PR is enough to not make you really think about that while you’re watching these adorable videos. Estelle lights up any room and Oscar is a mini-Carl Gustaf. Victoria’s hair looks lovely down. She should trade in her evil headmistress buns for something more flowly every now and then. Madeleine should be sharing some photos of Leonore and Nicolas soon. She usually puts something out with every season, if memory serves.